I'm working on the tutorial now and am currently uploading the videos to Youtube. 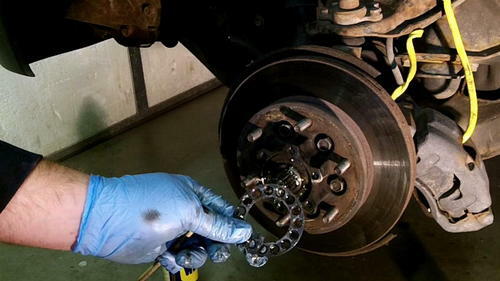 If you are hearing popping, grinding, or clanking when you turn the wheel of your car, truck, or SUV it probably means the CV joint of your axle is damaged. 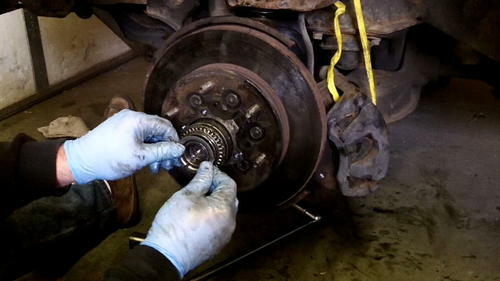 If you have a mechanic replace your axle it will cost you anywhere from around $300 to $1000 to have it fixed- Price depends on the car or difficulty of the repair. 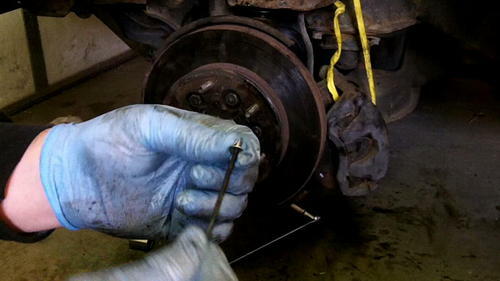 If you're like me, the cost of having someone repair the problem cost's more than the vehicle is worth. If you've got a little time you can do this repair yourself and save a ton of money- I was able to do this repair for $155, and that includes the price of the specialty tools I had to buy. 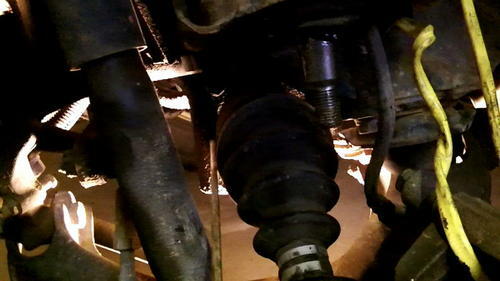 I decided to do both axles, because both CV joint boots where torn, and it cost me $215. Of course that doesn't include the cost of my time but sometimes you've got the time but not the money. 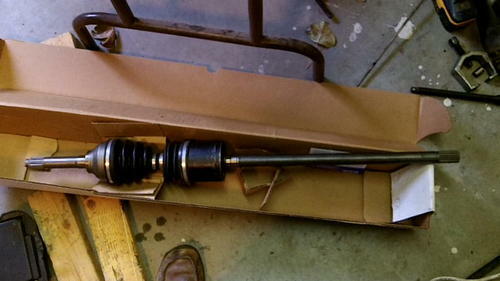 I figured I saved about $1,300 replacing both axles on my own. Here is the breakdown of the money spent on the front driver's side axle or the repair in this tutorial. 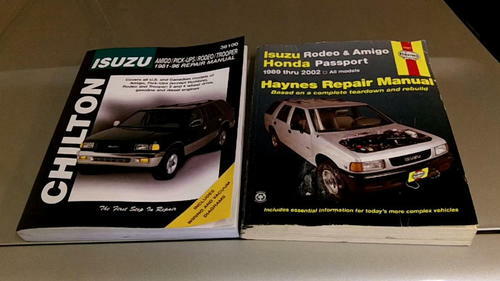 If you've got a car that you plan on repairing then picking up both a Chilton and a Haynes repair manual is a good idea. Both books have their strengths and weakness and both contain diagrams and instructions that one or other may or may not have. I couldn't say which one will benefit you most but for this particular repair the Haynes help me out better. 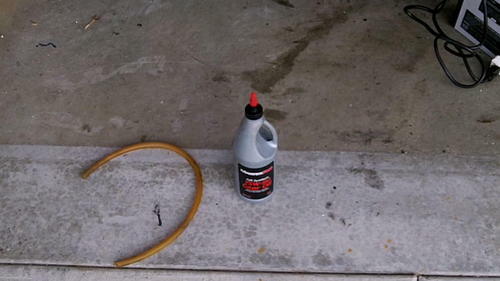 Here are some specialty tools that I recommend for this project. Note these tools are in addition to that standard tools like a ratchet set, hammer, etc. and will cost you about $70 altogether. 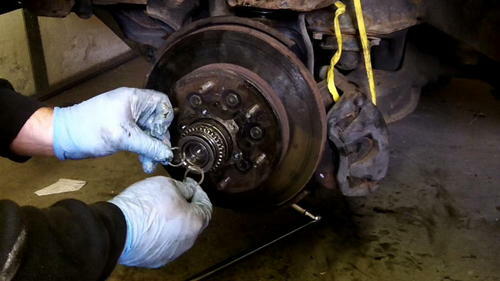 If you have old differential oil or it hasn't been replaced in while, it's a good idea to replace it. 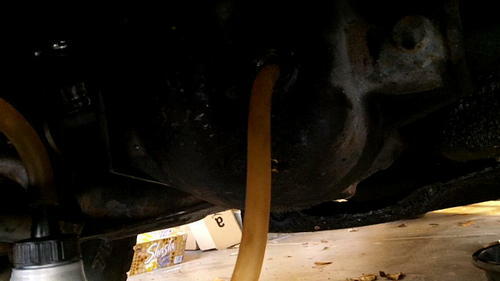 My differential fluid was just replaces so I will just allow whatever oil in the axle hosing to drain out. Then I'll just top of the oil once the repair is finished. Below is the filling bolt. 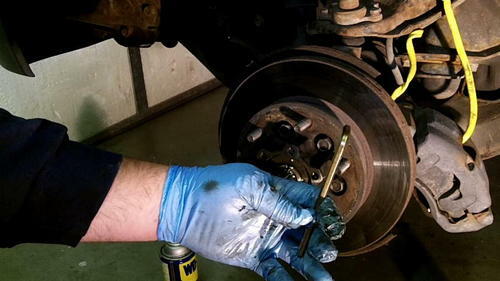 Make sure you can loosen the filling bolt before draining or removing the draining bolt. 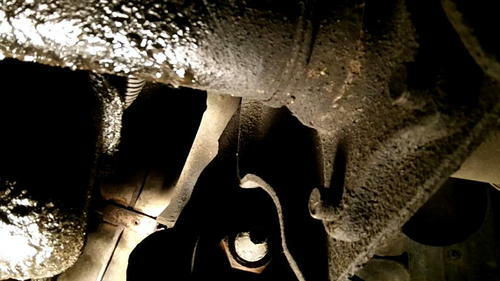 The draining bolt is located at the bottom and rear of the differential. 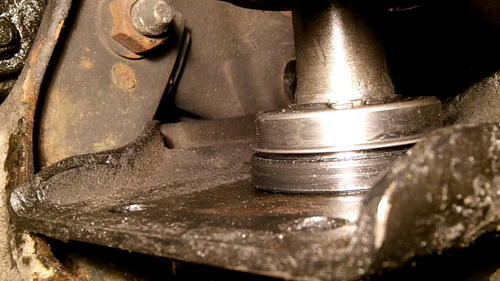 Use some jack-stands to support the vehicle. It is important to support the frame of the vehicle. Otherwise your floor panels or etc could give way injuring you or even killing you. Please be careful and safe. 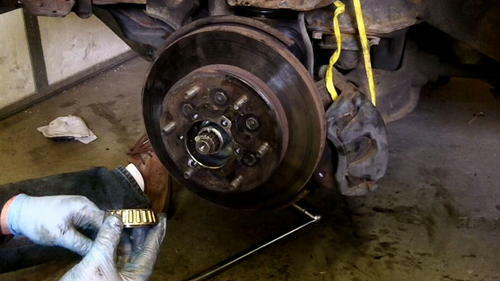 Here you can see me pointing to some bolts on the rotor's wheel lug mount. You do not need to remove these bolts. Remove the auto-locking hub assembly's housing buy removing the 6 bolts you can see me pointing too in the picture below. 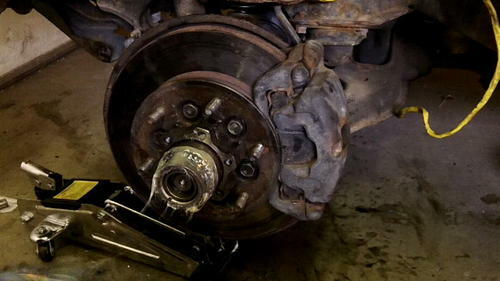 You'll also need to remove the brake caliper from the rotor. 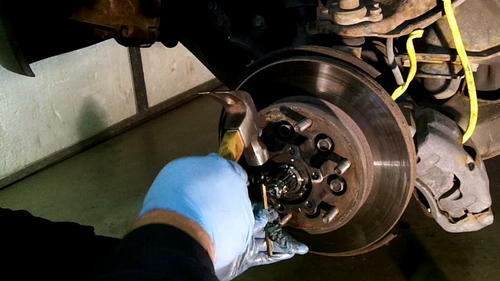 There are 2 bolts on the back side of the spindle assembly holding the brake caliper to the rotor. 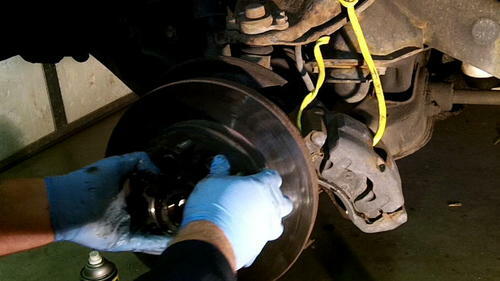 Once the caliper is removed hang it with some wire so that there is no tension on the break line. 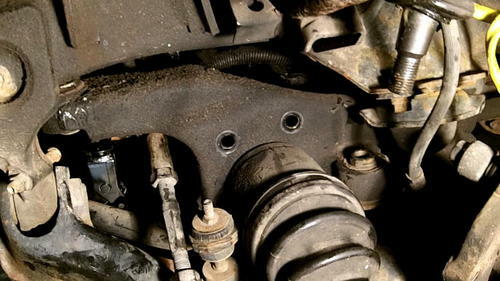 If the break line ruptures it will cause a mess and then you'll have to top off your break fluid and may even have to bleed your break lines. 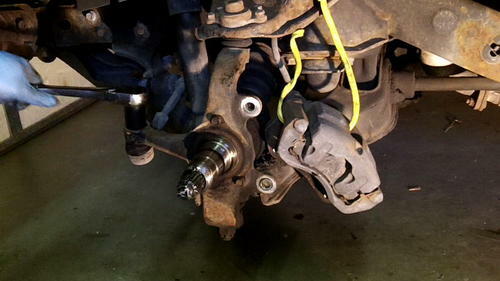 I hung the calipers with a wire off the upper suspension control arm. 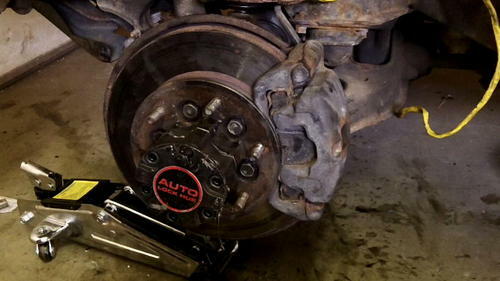 Once your break caliper is hung and out of the way, you'll need to remove the auto-locking hub's clutch assemble. 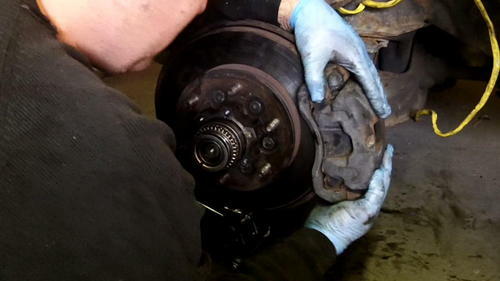 There is a small clip ring holding the clutch to the axle. Below you can see me holding the ring after removing it. Note: It may be hard to see the ring if you clutch assembly is full of grease. 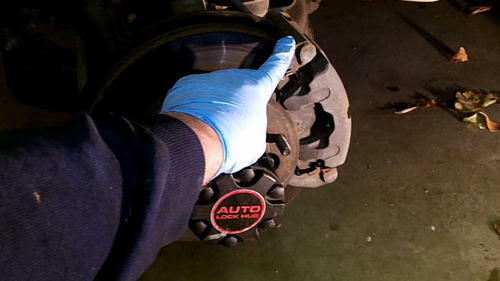 Once you've removed the locking or clip ring the clutch comes off with little effort. 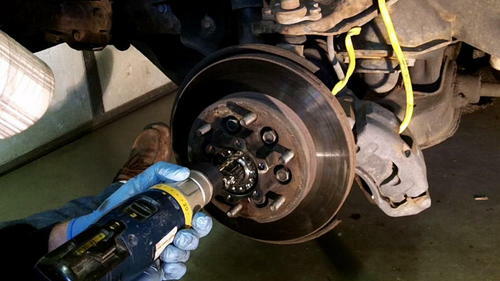 After removing the clutch assemble there is a spindle retention nut that holds the rotor onto the spindle. It is locked on with a washer that has 3 screws holding it to the spindle nut. For some reason these screws are impossible to get out without stripping out the heads (where the Philips part of the screwdriver locks in). I had to use a 1/4" drill bit to shave off the heads of the screw. After doing some research this seems to be a common problem with this model of rodeo. Be careful not to drill into the spindle nut. You just want to drill far enough to where the head of the screws come off. Once the screws are taken care of the locking or retaining washer comes off without a problem. Now that the washer is off it is time to remove the spindle nut. There is a special tool that you can buy for this but I found that a beefy Allen wrench will do the job nicely. Just insert the short end of the Allen wrench into the spindle nut's left hole and gently tap it with a hammer until it looses up. Note the position of the spindle nut as you will want to try to match it when re-assembling it. 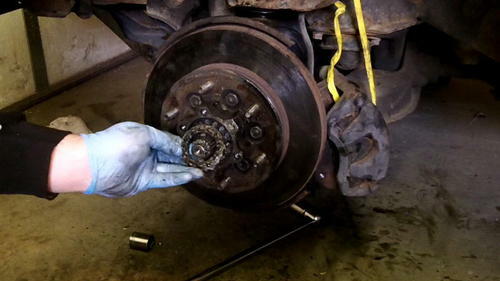 Now that the spindle nut has been removed, you can easily pull the rotor off the spindle. This is a baring that came out of the rotor after I removed the rotor from the spindle. I put the rotor guards bolts back onto the spindle assemble so I wouldn't loose them. 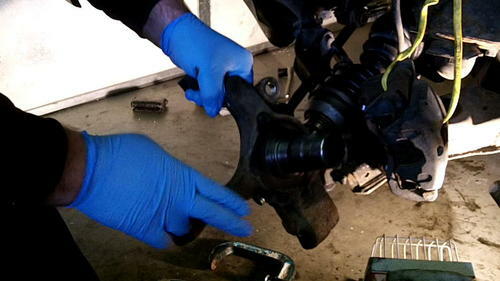 There are 3 ball joints that need to be removed from the spindle arm knuckles. 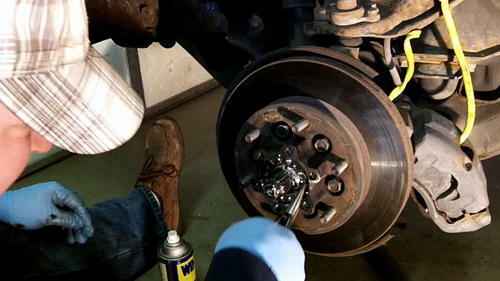 There is an upper, lower, and steering ball joint that needs to be separated. 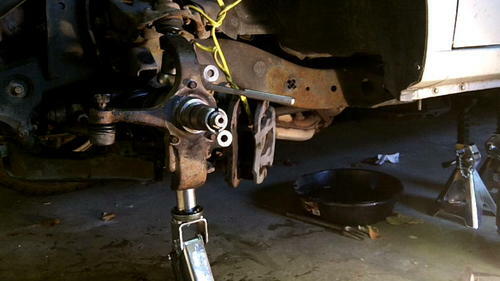 In the picture below I used a car jack to lift the spindle assemble up so I could get a ratchet and socket between the axle and upper ball joint. 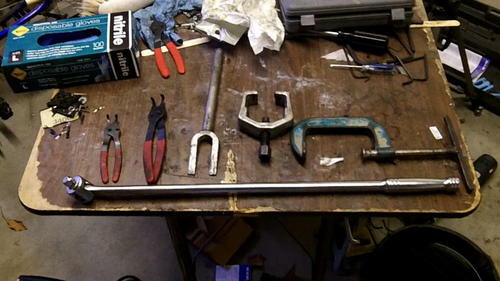 If you've got a crescent wrench that will fit the bold you probably don't need to lift the spindle assembly. 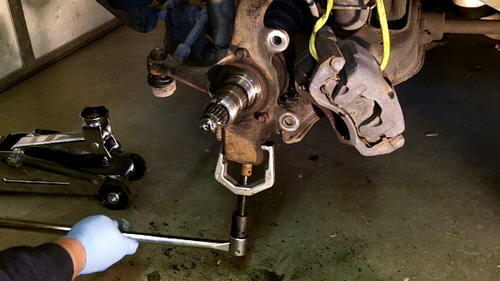 Once all of the ball joint's stud or bolt nuts were removed I used the pitman arm puller to remove the lower ball joint. 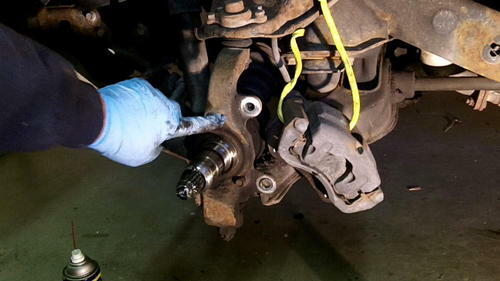 Note: it can be very difficult to separate this lower ball joint. 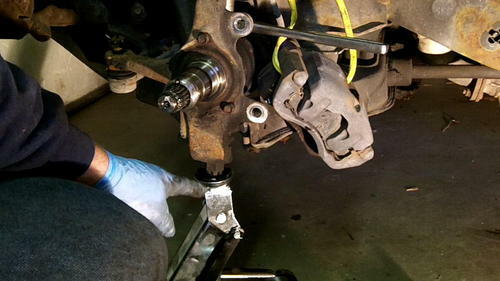 I had to use a breaker bar and hammer to remove the upper and lower ball joints. 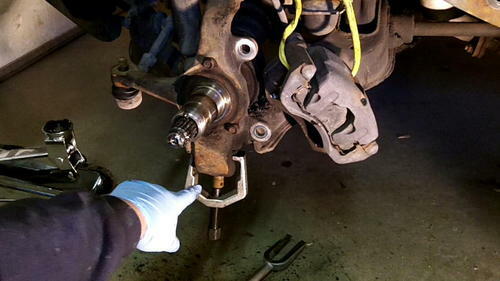 The steering knuckle also needs to be removed and this ball joint separator does a nice job of that. 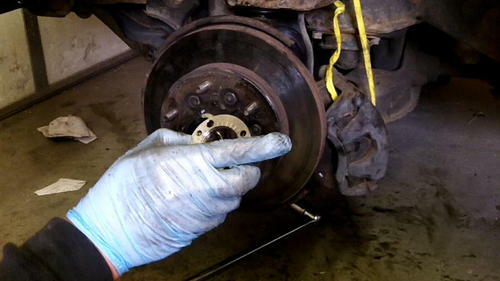 The first time I removed one of these I used a hammer and jacked up some of the threads on the ball joint stud. I had to grind it down to get the nut back on it. 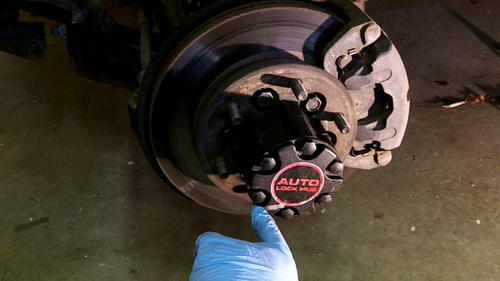 This tool will save you a lot of headache but be careful not to damage the ball joints protective boot. I'm using a wooden dowel here to point to the various items that I am going to discuss. 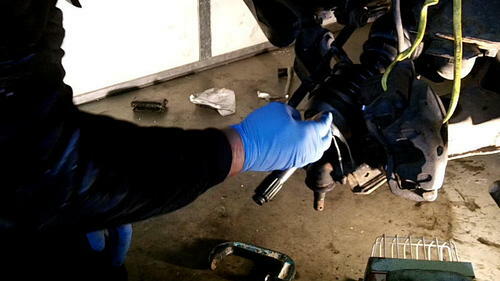 In the picture below you can see me pointing to the differentials axle housing cover. It is held onto the axle housing by 4 bolts and onto the Rodeo's frame by 2 bolts. This is one of the 4 bolts holding the differential plate to the axle housing. 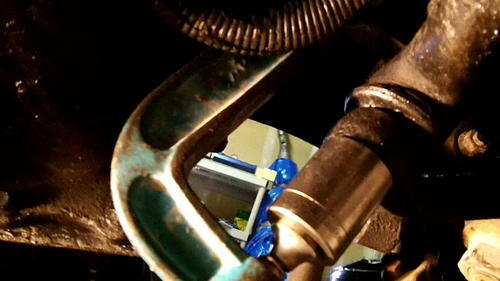 The bolt I am pointing to here is one of the bolts that holds the differential plate to the frame of the Rodeo. It's corresponding nut is integrated into the frame so there is no need to worry about getting a wrench above it to get it off. I had to use the breaker bar to loosen these bolts up. This is the other bolt holding the plate cover to the frame. 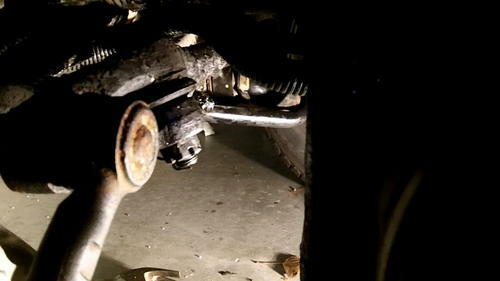 It is located toward the front of the vehicle and it does have a nut that is not integrated with the frame. 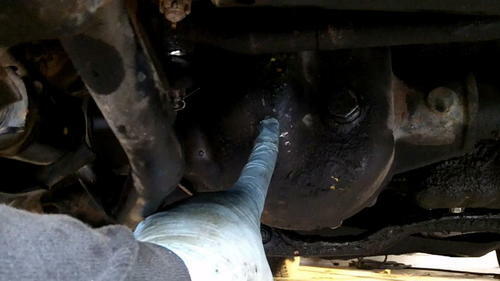 You can access the nut toward the top of the wheel well. It was tricky getting a wrench in there to hold the nut so it didn't spin but with a little finesse it isn't too hard of a job. I also had to use the breaker bar on this bolt. 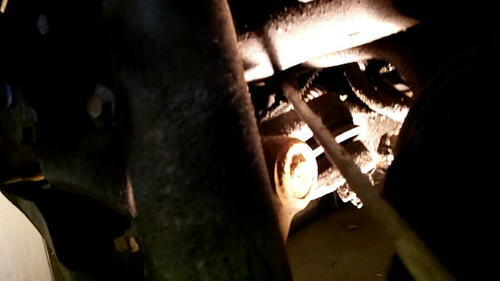 In the following picture you can see me pointing to the steering linkage on the central steering rod. 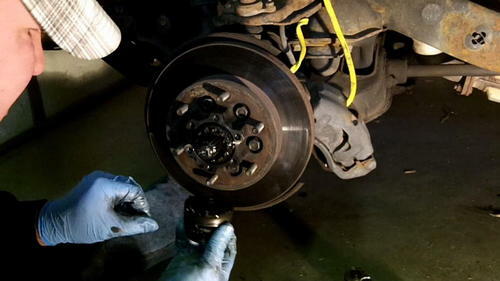 It is a ball joint that I decided to take apart because I was going to try to remove the plate cover through the wheel well with the whole axle attached to it. 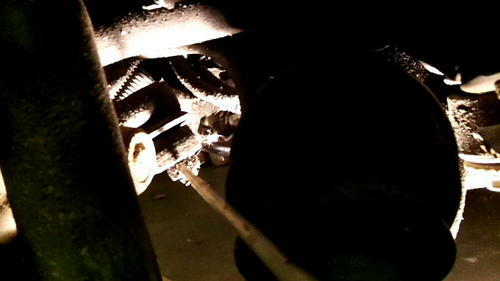 I ended up having to disconnect the axle from the plate before removing everything so I don't know that I need to have disconnected the steering joint. Here is a look at the back side of the plate cover and axle housing. I took this picture from underneath the vehicle. 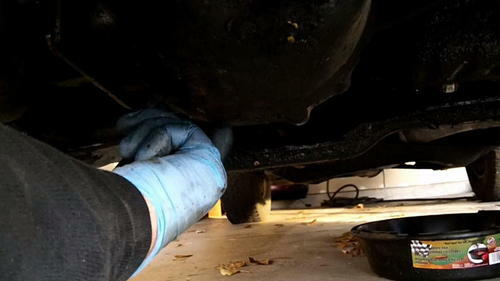 After removing all 6 bolts from the plate cover you can see that it is going to be impossible to remove the plate cover through the wheel well with the axle still intact. Note: you probably could get it out but not without dismantling a lot of parts first. 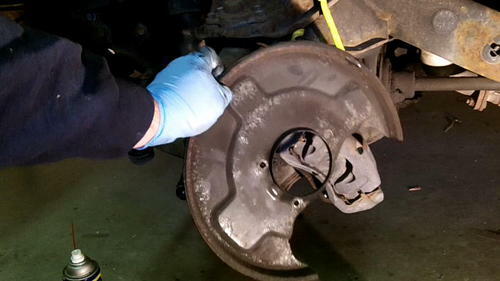 I decided that it was going to be easier to disconnect the axle before removing the plate- And it was. 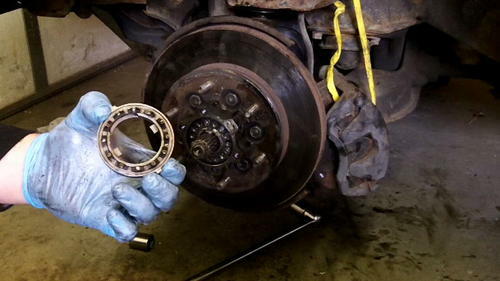 There are 2 snap rings a bearing, and gasket holding the axle to the plate. 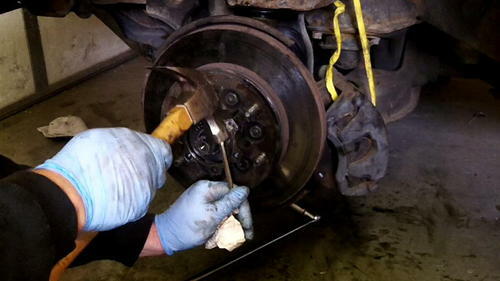 Here you can see me removing the first snap ring from the axle. It was getting to hard to take pictures while under the Rodeo so after dismantling the axle from the plate I reassembled it so you could have a better look at it. Basically you can see that the first snap ring and bearing are disassembled. Now there is another snap ring and rubber gasket to remove. 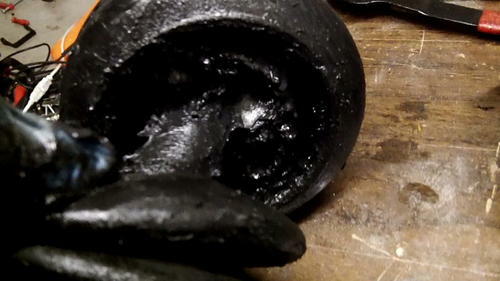 This is what the bad axle boot looked like. I think it is missing a few bearings. Using a drill press and 1/8" drill bit, I drilled out the stripped out screws from the retainer nut or retainer. I was careful not to drill into the nut's threads. Luckily all of the screw's threads came out fo the nut when drilling the screw out so I didn't have to do any more work on the spindle nut. I went to the local hardware store and picked up some new screws. These are stainless steel M4 - .70 x 8mm with a 2.5mm hex head. I decided on a Hex head because I thing it will be easier to get out if the spindle nut ever needs to be removed again. Here is a look at the new axle. 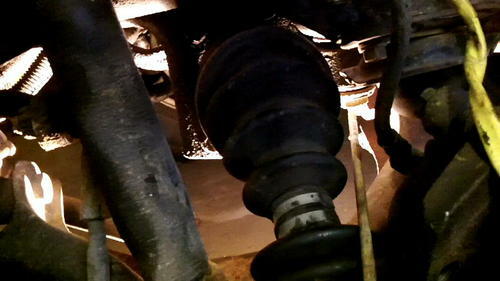 The only difference between this axle and the bad one is that there is no dust shield at the rotor's CV joint. 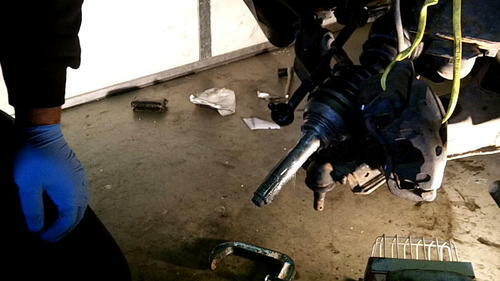 I reinstalled the axle the same way I got it out. I put the plate back where it goes and then slipped the first part of the axle into it. With the axle just going through the plates hole, I put the busing, snap ring, bearing, and final snap ring onto the axle and then pushed the axle all the way into the axle housing. 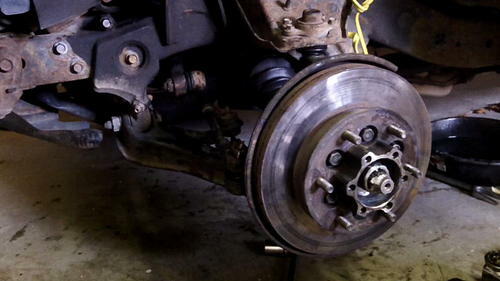 I then reassembled the busing and bearing to the axle with the snap rings and I was good to go. Just note that the bearing was kind of a pain to get back on but it was easier then fishing the plate through the wheel well. 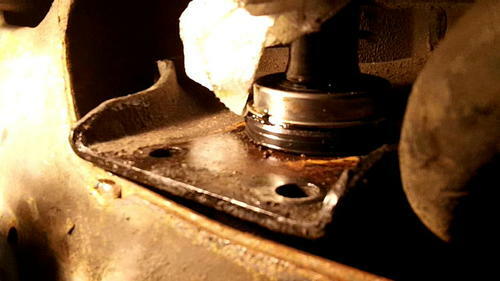 Once the axle was reattached to the plate I fasted the plate to the axle housing with the 4 bolts that hold it on. I then used a jack to lift the plate up against the frame and tightened down the bolts holding the plate to the Rodeo's frame. 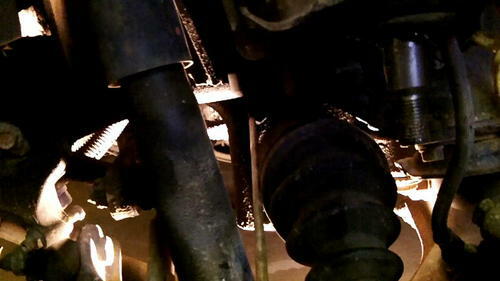 I reassembled the steering linkage buy re-compressing the ball. 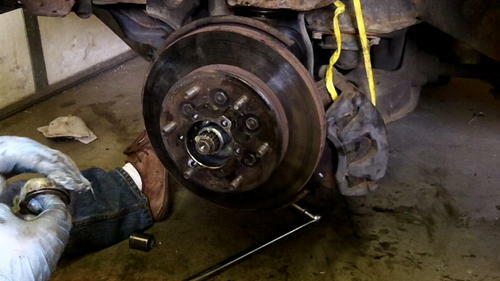 You can buy a tool for this but a 4-6" clamp with a socket works great to re-compress these ball joints. Once the ball joint was re-compressed I was able to tighten down the nut and add the cotter pin back into the ball joint's stud or bolt. 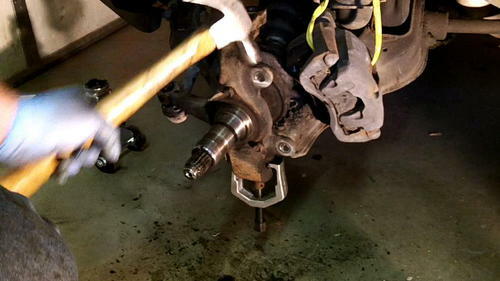 The first thing to do when reinstalling the spindle assembly is greasing anything that moves. 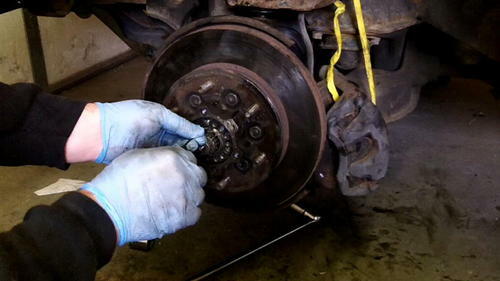 In the picture below you can see that I am greasing up the axle. I am used high heat NLGI N0.2 grease for pretty much all the moving parts. 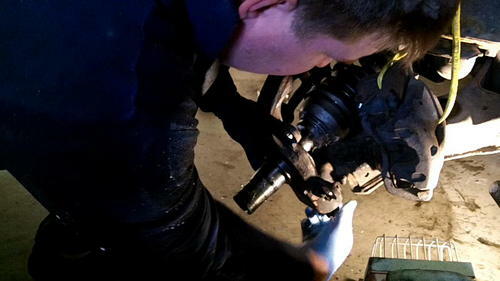 Below you can see that I have slipped the axle into the spindle and have also inserted the lower A arm's ball joint stud into the lower arm of the spindle assembly's knuckle. 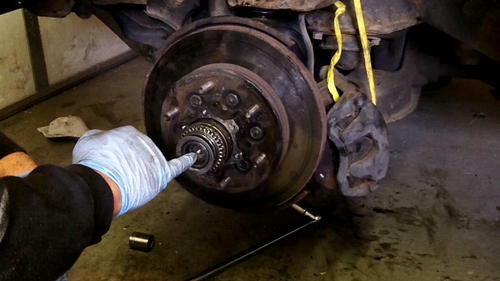 Once a nut is added to the ball joint stud, the spindle assemble wont fall off the axle. 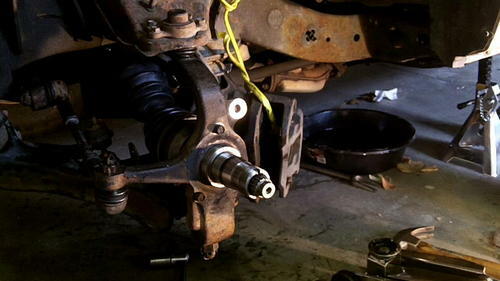 I then put the steering ball joint and upper ball joints back together with their corresponding nuts. You can see in the picture below that I am using a car jack and socket to lift up on the spindle assembly in effect re-compressing the upper and lower ball joins with the spindle. 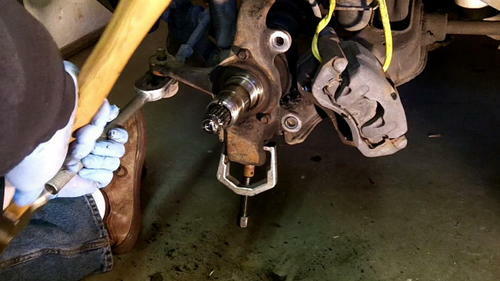 I had to tap the upper A arm's ball joint with a hammer to help compress the stud in the spindle's upper knuckle. Note the socket on the jack. It may look unsafe... but, because there is a bolt and nut inside the socket there is no way the socket could come flying off. 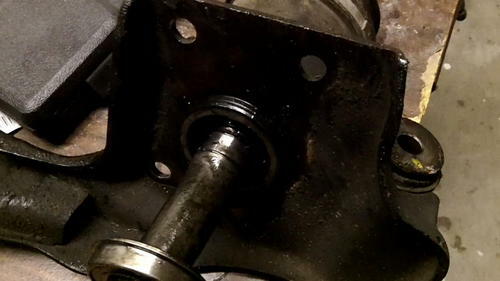 I went ahead and re-compressed the steering ball joint with the steering knuckle using the C-clamp and socket method used earlier and then tightened all of the ball joint nuts and finally added the cotter pins. I then re-attached the rotor guard to the spindle. 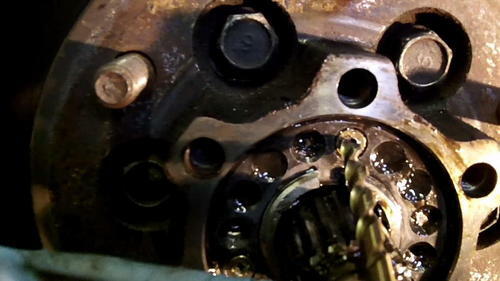 Before slipping the rotor back onto the spindle I greased the inside of it like crazy. I couldn't get a shot of it but there is kind of a cavity where the spindle bearing goes inside the rotor. I chalked that full of grease. Here I am greasing up the spindle bearing. Note the the spindle bearing goes onto the spindle with the smaller side inserted first. 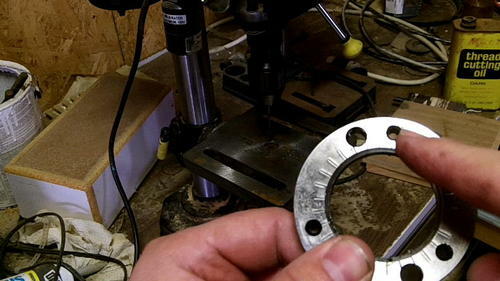 Next, the spindle nut or spindle retainer needs to be screwed back onto the spindle. I used a large allen/hex wrench to tighten the spindle nut. 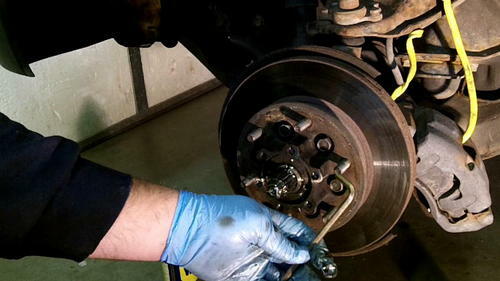 For best results you should tighten the spindle nut to the manufacturers recommendation. I didn't have the special wrench tool to gauge the torque I needed so I just tapped it down until it was snug and in about the same position as when I removed it. Here I am adding the locking washer. There are to keys on the washer that slip into key holes on the spindle and the counter sunken holes face out. 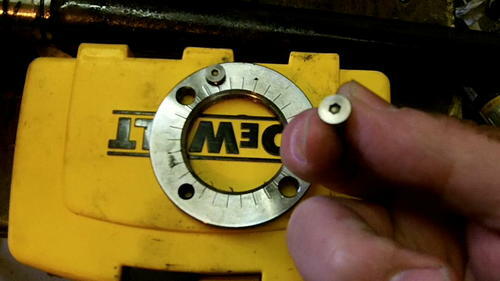 If your washer and spindle nut holes (holes for the screws) don't line up, try rotating the washer 180 deg. 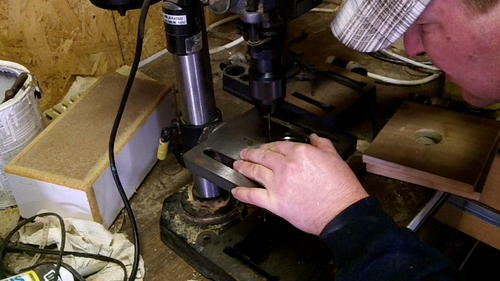 If the holes still don't line up you'll need to either tighten or loosen the spindle nut until they do. These M4 screws have a hex head of 2.5mm and they go back on easily. I'm just tightening the screws up here nice and snug but not too tight. 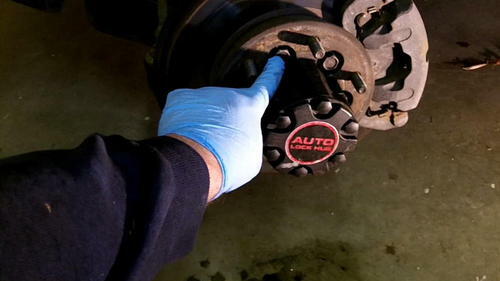 Time for the auto locking clutch assembly. Just grease her up and reinstall. Note the keys on the parts and they are lined up with their corresponding recesses. Adding the snap ring back onto the axle can be a pain. Note that this is a washer that goes on before the snap ring. 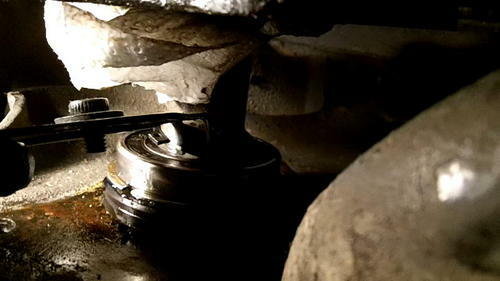 There is a bolt hole in the center of the axle that can be used with a bolt for leverage (I'm pointing to it in the picture below). However, I didn't want to run to the store to get another bolt so I just pulled the axle from the backside of the rotor and had my wife snap the rings back on for me. 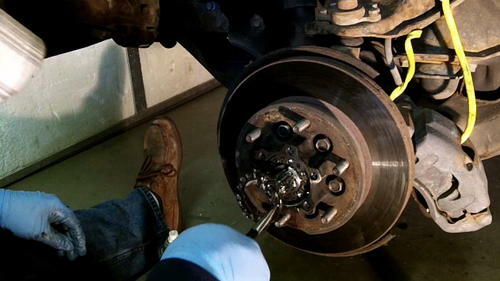 I re-compressed the brake callipers pistons and re-attached it to the rotor. 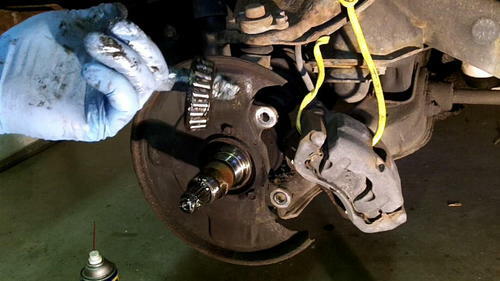 Once attached I just bolted the calliper onto the spindle assembly with it's corresponding bolts. 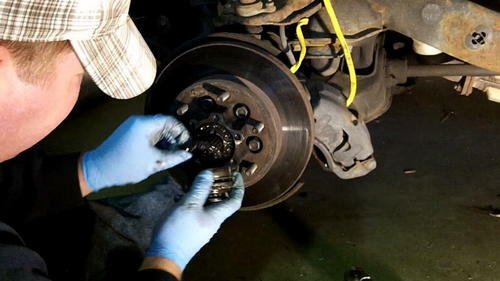 Before putting on the auto locking hub's cap, I gave it a good dose of grease. Finally, I added the housing and reinstalled the housing's cover and corresponding bolts. 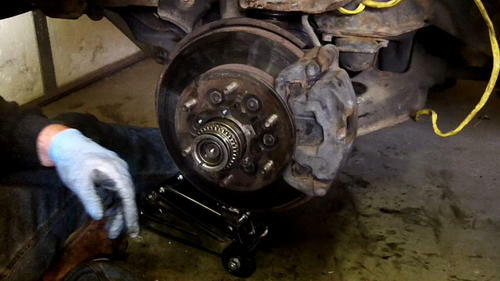 After the auto locking hub assemble was put back together, I put the wheel and lugs back on. I then removed the jack-stands and lowered the vehicle. I do not have a limited slip differential so I don't need the differential oil with the limited slip additive. I also don't own an oil pump so I just grabbed some surgical tubing I had laying around to get the oil back into the differential. 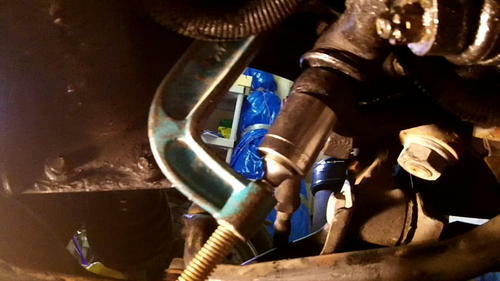 After removing the filling bolt I attached the surgical tubing to the be differential oil's bottle and squoze oil up into the the differential. 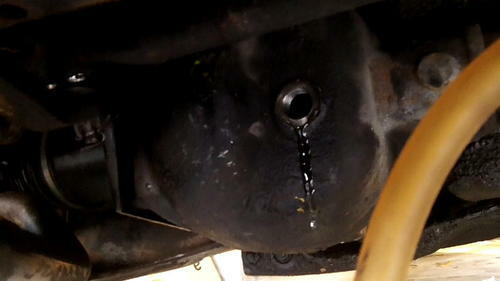 Once the oil stared dripping out of the hole I was done filling and re-installed the filling bolt. I drove around the block a few times and and listed for any popping or grinding. Since everything sounded good I went to a open parking lot to test everything out. I did tight turns while in both 2 and 4 wheel drive and also tested the brakes. I've got a few hundred miles on the Rodeo now since repairing it and writing this tutorial and everything seems to be working just fine. I've even had to drive it for a while in 4 wheel drive during a bad snow storm and didn't have any issues or problems. 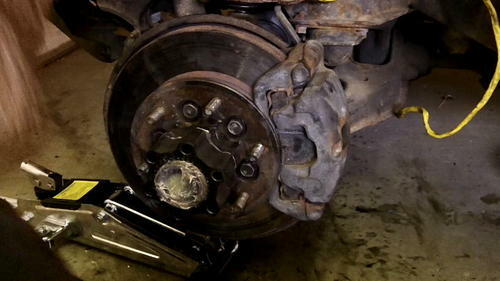 Hopefully, you'll be able to save yourself a few bucks if you decide to do this repair yourself. If you've got any questions or comments let me know.